The cart wheels were dropped off and then picked up from a local sand blaster. Next they went to a friends auto shop for a paint job. While waiting for their return I began to make a shadow box for my wife. Beginning with visions of using some left over Sapele and imagining the beautiful look of the dovetailed corners I quickly had to reverse direction when the word paint was spoken. Nothing wrong with paint except I’m not a great painter and I have no intention of using a beautiful wood which will be hidden from view. Fortunately I found some pine in the corner and pressed on. 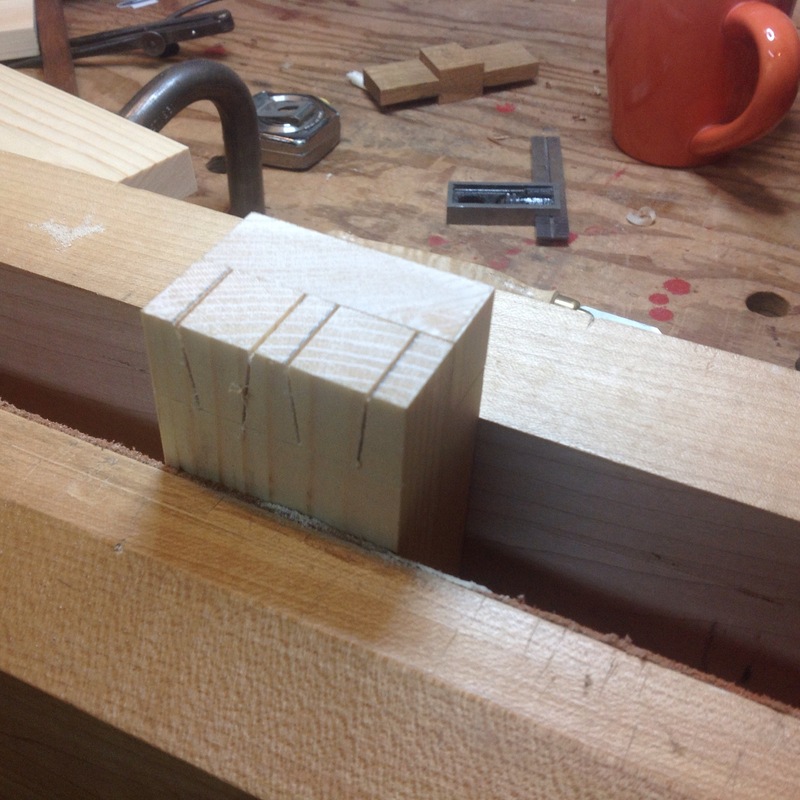 No dovetails have been cut since the small tool chest project so I warmed up with a couple pieces of scrap. After marking the tails I set to work sawing and then chopping out the waste. You will notice in the pictures that I used a piece of scrap wood on the first cut, then used it as a guide for the other dovetails. This ensured they were all similar and made the layout process much quicker. Paul Sellers showed me this trick when I attended his foundations class. I was also greatly helped by a freshly sharpened Bad Axe Saw. When I was at the saw sharpening seminar, Mark Harrell took the saw and gave it a little personal service. It’s cutting great. 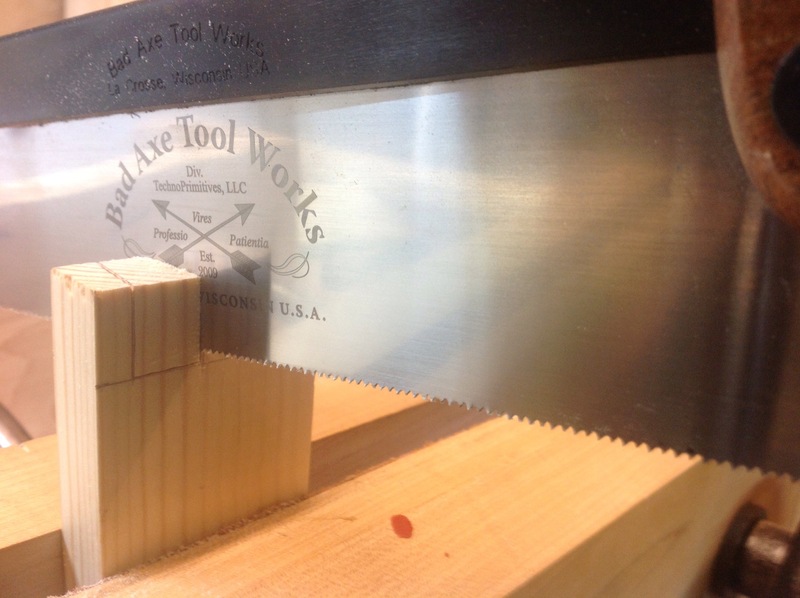 Although I sharpen most of my own saws there is nothing like have a pro do it for you. With the tails cut I chopped out the pins and within the space of three hours I went from some boards to a dovetailed frame. Next step is to cut the grooves for the glass. I used a couple of tricks to get this done. 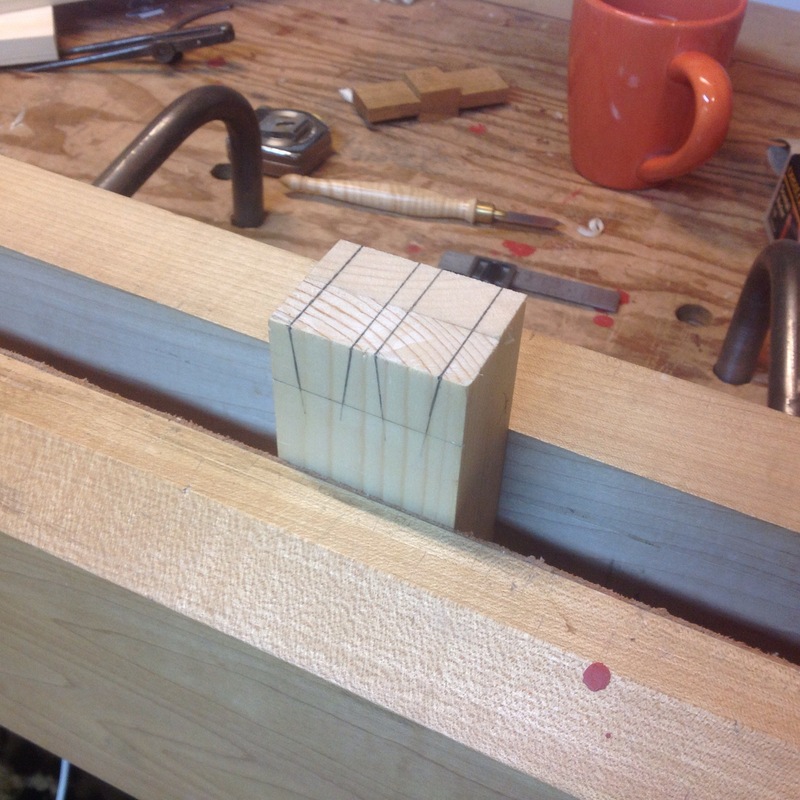 The first is to secure the boards using a clamp into my bench vise. this gives me all of the security I need and access for the plow plane. The plow works great everywhere except those ends where I can’t break through and expose the groove. I could fix this with some blocks inserted at the end of the process or switch tools. In this case I grabbed my router plane and using the guide finished up the grooves with little fuss.The final piece of construction is making the rabbit (rebate) for the back panel. Your picture with the plow plane intrigues me! 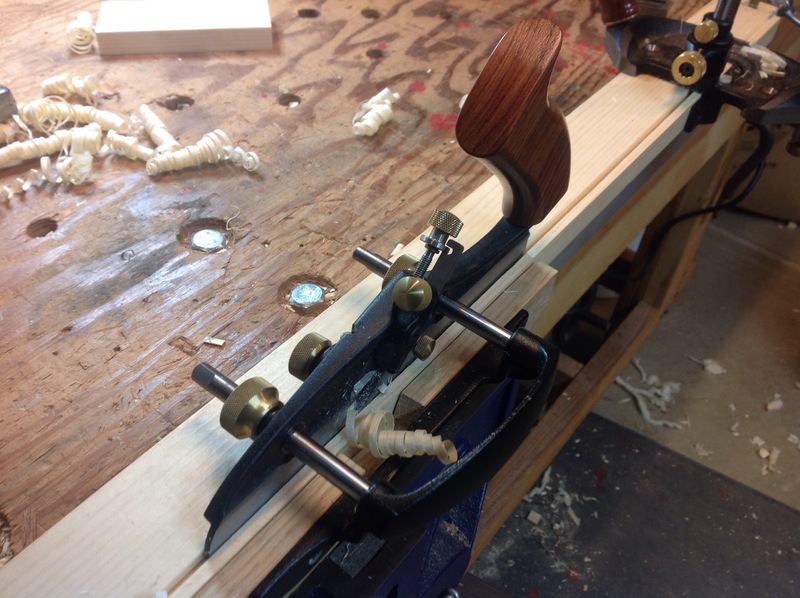 Are you cutting a stopped groove with it then following up with the router plane to cut it through? I didn’t know a plow could start and stop in the middle of a board or am I just way off base? Thanks for your reply, I’m on the waiting list for L-N plow plane so want to know all of the possibilities before I (probably) make the purchase when it’s available! 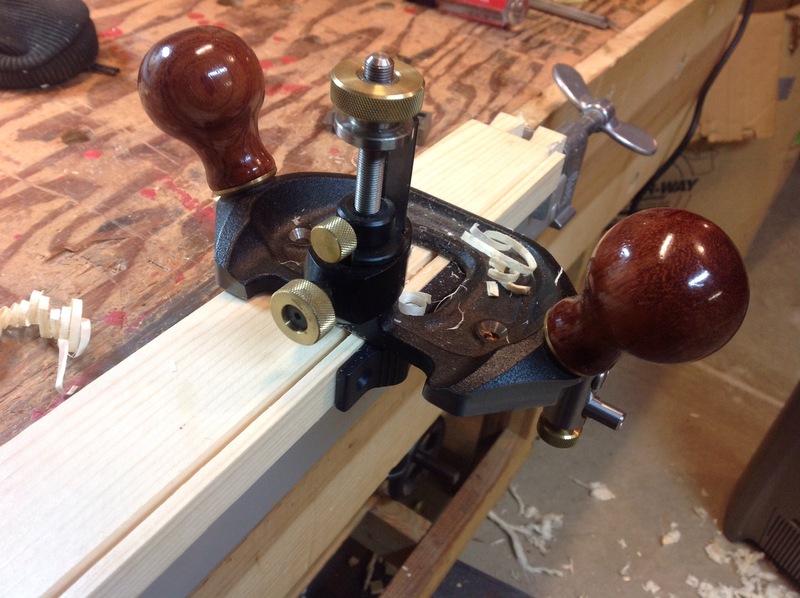 I made two passes with my plow plane to mark the groove, then used the groove to set the fence on my router plane. The router plane was then used to make the groove where the plow can’t reach leaving room for the skate. You are correct that the only way the plow could complete the job is by cutting the groove along the entire length of the board which would require me to make a repair later on. In this case that would have worked since I’m painting the piece. I haven’t seen a LN plow plane but make sure it has the ability to make tongue and groove joints. The Veritas has an optional attachment and blades which make tongue and groove joints a lot of fun. It’s definitely my favorite plane. Thanks for the info. The LN plane isn’t out yet but on my list so only rumors about what it will have. Currently working on a project for a client out of Bubinga and using shaper cutters! Getting more desire all of the time to “cut the cord” and go all hand tools!